NOTES procedures were performed in 5 dogs by creating access to the abdominal cavity via the stomach using a flexible endoscope and guide wire, needle knife electrode, and balloon dilation catheter. Following inflation with air, an electrocautery snare was used to coagulate and cut tissue to remove the ovaries. The ovaries were then extracted, visually examined, and the gastric incision was closed with a T-fastener suture device and clips. Two, 4, 6, 12, 24, 36, 48, and 72 hours after surgery, the dogs were assessed for pain using the Melbourne Pain score and nociceptive threshold measurements. Blood samples were collected for glucose, cortisol, and inflammatory mediators. Ten days later a necropsy evaluation was conducted to examine the sites and collect fluid samples for cytological evaluation and culture. The mean operative time was 3 hr 20 min (range 2 hr, 40 min to 4 hr, 25 min). Major complications included dropping one ovary during extraction in one animal and moderate subcutaneous emphysema that resolved over 10 days in another animal. Glucose and cortisol levels were increased after surgery and returned to normal values by 72 hours and 36 hours, respectively. IL-6 peaked 2 hours after surgery and returned to near baseline by 36 hours after surgery. C-reactive protein peaked between 12 and 24 hours following surgery and began a trend towards baseline by 72 hours. Pain threshold measurements returned to baseline by 36 hours. At necropsy, all sites were healing as expected with minimal adhesions to the gastric incisions, no significant damage to surrounding structures and no evidence of septic peritonitis. Cultures were negative. 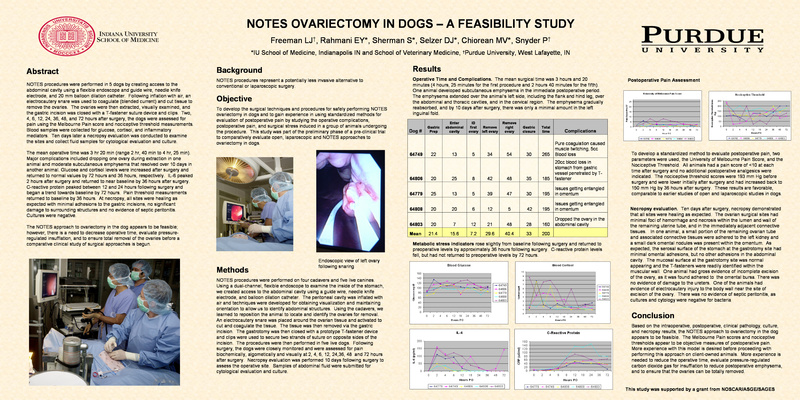 The NOTES approach to ovariectomy in the dog appears to be feasible; however, there is a need to decrease operative time, evaluate pressure-regulated insufflation, and to ensure total removal of the ovaries before a comparative clinical study of surgical approaches is begun.